It is the middle of December, Hanukkah begins tonight at sundown, Christmas is in 5 days, I am deeply consumed by Nutcracker performances, and it still hasn’t snowed. What’s with that? Regardless, this is quite a magical time of year. Families are getting together, hot chocolate is in abundance, blankets litter the couch, and I find myself desiring anything warm and comforting. Yesterday’s desire was macaroni and cheese. Completely from scratch of course. A few weeks ago on an afternoon break I sat down in front of the TV to watch the Food Network. (One of my favorite stations). Ina Garten, better known as the “Barefoot Contessa”, was making the most delicious looking macaroni and cheese. An avid fan of cheese, I was immediately awe-struck and fell in love with the idea of making (and consuming) it myself. It took me a few weeks to find the time and muster up the energy but yesterday I finally made the commitment. We have friends visiting and I was feeling hostess-like so I seized the moment and made macaroni and cheese for everyone. The recipe that Ina Garten has posted on the Food Network website serves only two people so I roughly increased all the measurements, trying to keep them proportionate. Here is the link to the recipe on Food Network and also what I did. To begin, preheat the oven to 400 degrees. Place the bacon on a cooking sheet that has sides because it will come out swimming in hot grease. Bake for 15-20 minutes or until the bacon is beautifully brown. Set aside. Once it has cooled you can break it apart into bite sized pieces. Put a pot with water and a bit of salt on the stove to start boiling. Cook the pasta according to the package directions. As that is going, Pull out two more pots. Hopefully you are well stocked in the pot department. In a smaller one, heat up the milk without letting it boil. In a larger pot, melt the butter. Once the butter is melted add the flour and whisk for about 2 minutes. lowly add the hot milk and stir for another 2 minutes as it begins to thicken. Turn off the heat and add in the cheese, bacon pieces, salt, pepper, and nutmeg and stir. If you succeed at multi-tasking (for me everything finished at the perfect times) all components should be ready to be combined at this point. Mix the pasta and the sauce together and pour it all into the baking dish of your choice. Sprinkle the parmesan and bread crumbs on top and slide it in the oven for 35 – 40 minutes until the top is golden brown and the sauce is nice and bubbly. Consume and be amazed. 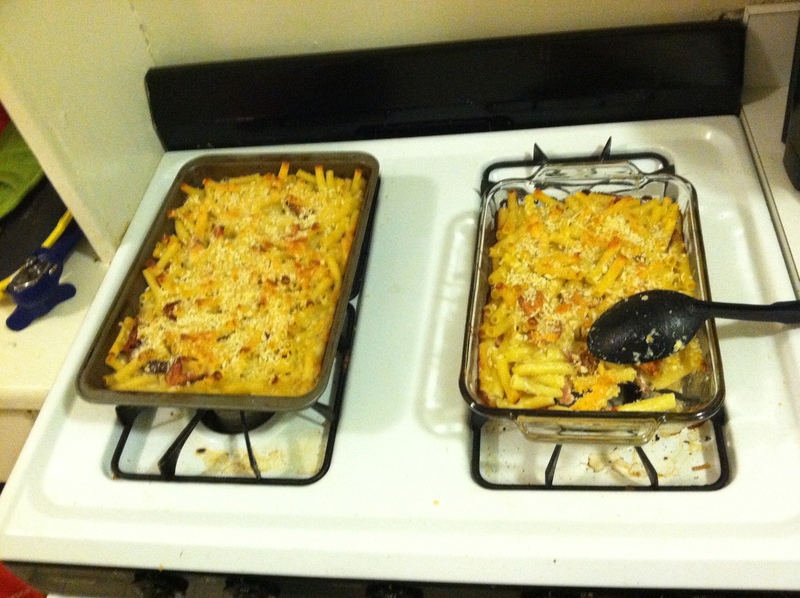 It was just as delicious as I was hoping and I am very proud that my first homemade macaroni and cheese was a success. The crowd went wild.